James Joyce is located between, and constructed within, two worlds: the national and international, the political and cultural systems of colonialism and postcolonialism. Joyce's political project is to construct a postcolonial contra-modernity: to write the incommensurable differences of colonial, postcolonial, and gendered subjectivities, and, in doing so, to reorient the axis of power and knowledge. What Joyce dramatizes in his hybrid writing is the political and cultural remainder of imperial history or patriarchal canons: a remainder that resists assimilation into the totalizing narratives of modernity. Through this remainder - of both politics and the psyche - Joyce reveals how a minority culture can construct political and personal agency. 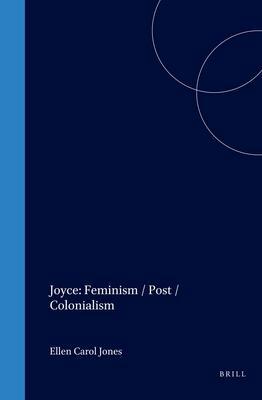 Joyce: Feminism / Post / Colonialism, edited by Ellen Carol Jones, bears witness to the construction of that agency, tracing the inscription of the racial and sexual other in colonial, nationalist, and postnational representations, deciphering the history of the possible. Contributors are Gregory Castle, Gerald Doherty, Enda Duffy, James Fairhall, Peter Hitchcock, Ellen Carol Jones, Ranjana Khanna, Patrick McGee, Marilyn Reizbaum, Susan de Sola Rodstein, Carol Shloss, and David Spurr. Bibliographical Note. Ellen Carol JONES: Borderlines. Peter HITCHCOCK: Joyce's Subalternatives. James FAIRHALL: Northsiders. Ranjana KHANNA: Araby: Women's Time and the Time of the Nation. Carol SHLOSS: Behind the Veil: James Joyce and the Colonial Harem. Gregory CASTLE: Colonial Discourse and the Subject of Empire in Joyce's Nausicaa. Susan de SOLA RODSTEIN: Back to 1904: Joyce, Ireland, and Nationalism. Marilyn REIZBAUM: Joyce's Grand Nationals. Gerald DOHERTY: Imperialism and the Rhetoric of Sexuality in James Joyce's Ulysses. Enda DUFFY: Molly's Throat. David SPURR: Fatal Signatures: Forgery and Colonization in Finnegans Wake. Patrick McGEE: Masculine States and Feminine Republics: Finnegans Wake as Historical Document. Contributors.